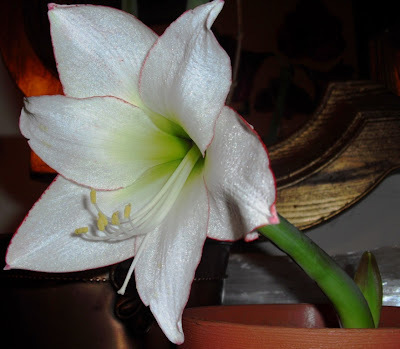 Previously posted photograph of my first Hippeastrum 'Picotee' flower, with its shortened, curved stalk. Not visible is the deep, grooved injury on one side of the stem (which is facing left in this shot.) I was afraid it was a symptom of some sort of disease. Picture from a couple of weeks ago, with H. 'Benfica' to the left, the first set of H. 'Picotee' flowers in the center, (the second stalk is visible behind the flowers) and H. 'Apple Blossom' on the right. 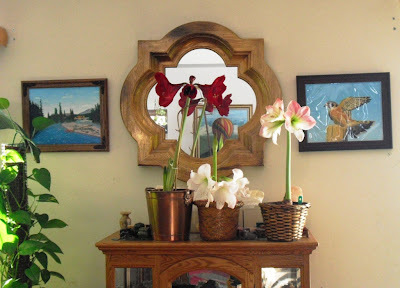 The scene is flanked by two paintings by my husband, Bob. Unfortunately, we hadn't removed some protective plastic from the painting of the Kestrel on the right, hence the rippled effect. This time the stalk is very tall, probably due to stretching, because I kept the plant in a relatively sunless location. 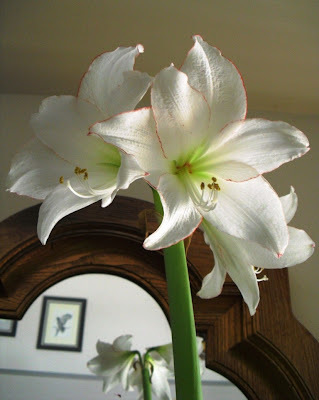 This is it for Hippeastrum blossoms for a while. Since, I didn't bother to force my other plants, many of them are likely to bloom in spring or summer this year, if at all. 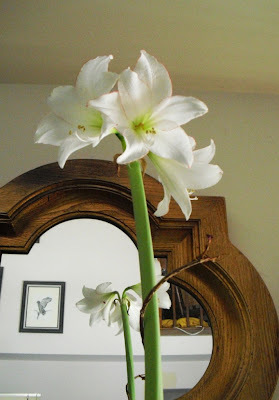 I was gonna buy another bulb if I had any money left at the end of this month, but ran into two new ivies yesterday, and spent my last money on them. Oops. Hi Ivynettle: I think if my choice were between another bulb, and more ivy, I'd pick the ivies too.